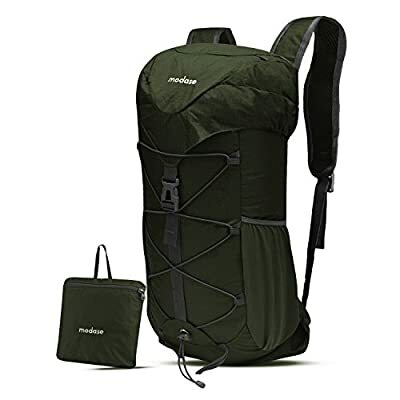 The best foldable Lightweight Outdoor Hiking backpack with a stylish look great for day-to-day use or occasional travel. The Backpack uses a top loading pouch with a drawstring lock. This enables you to fit more into your backpack, using the drawstring to give you more or less slack when needed. You are no longer confined to the restraints of a zipper lock. This Backpack is made with high quality tear and water resistant material, provides extra strength and long-lasting performance with the lightest weight possible. The extra strength provided by the double-layer bottom piece makes it very convenient to carry more load on your journeys. Longevity is further enhanced by bar-tacks at major stress points. Breathable mesh shoulder straps with plentiful sponge padding help relieve the stress from your shoulder. The length of the shoulder straps is adjustable. The chest strap with a whistle buckle help you lock your backpack in place securely. Hip belt use: mobile phones and pocket cameras can store small items on the class backpack hip belt. 1. Water-resistant coating fabric. Please don't wash with liquid detergent or bleach. 2. Clean with wet cloth if necessary. 4. Please do not iron it.